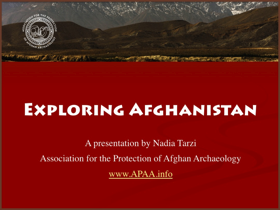 The APAA, Association for the Protection of Afghan Archaeology, was founded by Nadia Tarzi in December of 2002 in the State of California, U.S.A. The initiative to create the Association was a call from the heart and brought together a father's expertise and a daughter's passion. A non-profit organization with the 501C3 status, APAA is dedicated to the Archaeology and Cultural Heritage of Afghanistan. APAA's goals are to bring understanding and raise awareness thus ensuring the promotion of the Afghan Archaeological and Cultural Heritage through its teaching in schools and public venues internationally including in Afghanistan, in the Afghan and multi-cultural Bay Area community. Our work also consists in promoting and assisting in the education of the international public about the inherent value of archaeological treasures to cultural identity, and to specifically focus on the plight of Afghan people regarding the loss of their cultural heritage. The APAA will therefore combine different approaches in educating the younger generations as well as the older ones, by publishing children's books and organize International Cultural events. APAA is concerned with the lack of professional training in the sciences of archaeology, restoration and conservation and aims at providing thorough assistance in these areas. Finally, as the archaeological heritage of Afghanistan is in peril, APAA aims at sounding the alarm loud and far and calls everyone to get involved and help SAVE the archaeological heritage of Afghanistan NOW.